Last week, the Metropolitan Museum of Art opened its new Islamic wing: Galleries for the Art of the Arab Lands, Turkey, Iran, Central Asia and Later South Asia. The New York Times featured an interactive guide to the wing, including panoramic views of galleries which may be expanded to full-screen. The Metropolitan Museum of Art launched a new website this week, complete with high-resolution images available for download (for educational purposes).To download a high-res image, either search or browse the collections. Select an individual work, then click full view. Click the symbol at lower right to “Download HD Image.” This will bring you to a new screen where you can either right-click (PC) or control-click (Mac) to save. If you’re on a PC, you can also zoom to a detail in the full view and right-click to save it. If you have a MyMet account, images may be grouped in your account for later reference. Last week The New York Times published an opinion piece titled “Opportunity on Madison,” or What the Met Should Do When It Moves into The Whitney. The author discusses The Metropolitan Museum of Art’s recent lease of The Whitney Museum’s Marcel Breuer building on Madison Avenue (to be vacated by The Whitney in 2015) and the Met’s decision to display collections of modern and contemporary art there. I love the 1966 Breuer design. With its trapezoidal windows and stepped-back facade, it’s what the Guggenheim isn’t: starchitecture with the right amount of ego, meaning that it works for art. Almost everything looks good in it. And the Met’s residency, contracted to last at least eight years, seems like a great idea on paper. 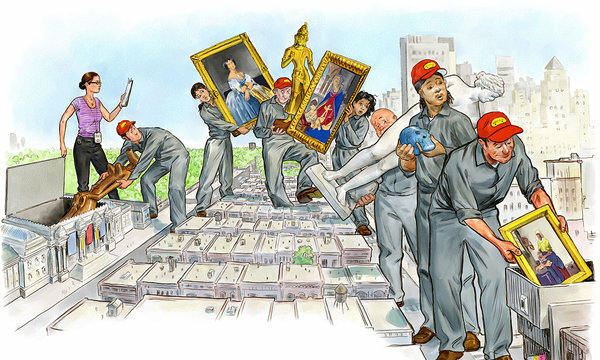 The Whitney Museum of American Art gets to keep its celebrated building, and the Met, which can never show more than a small fraction of its encyclopedic collection, gets some desperately needed space. But the Met’s use of that space primarily for new art would be a big mistake. What do you think? Should The Met utilize the space to house curated shows that include art from many eras, as the author suggests, or for contemporary and modern art, or something else? The Metropolitan Museum of Art’s Connections invites its diverse staff to offer their personal perspectives on works of art in the Museum’s vast collection. Their voices range from the authoritative to the highly subjective, and touch upon any number of themes and concepts. Connections is a year-long series comprising of 100 episodes, and inspires fresh ways to approach art. Throughout 2011, please join us on Wednesdays for weekly releases.